The fixture provides direct glare-free horizontal light while reflecting some of the light through the rear of the head, illuminating the top of the arm. The ergonomic design of the fixture head shapes the light and gives optimal light direction. A simple mechanical system provides great freedom of movement, so the light can always be set in the ideal position in the work space. The shade is painted white on the inside, reflecting comfortable diffused light. Switch: On the fixture head. Timer function: 4 hours or 8 hours. LED driver: separate, plugs into power outlet. Class: Ingress protection IP20. Electric shock protection II w/o ground. Energy Class A++ - A+. Its architect lamp heritage gives the light an extra dimension and adds signal value – NJP Table is primarily a work light. The lamp arms have two spring systems which ensure they can be steplessly adjusted to suit any work situation. 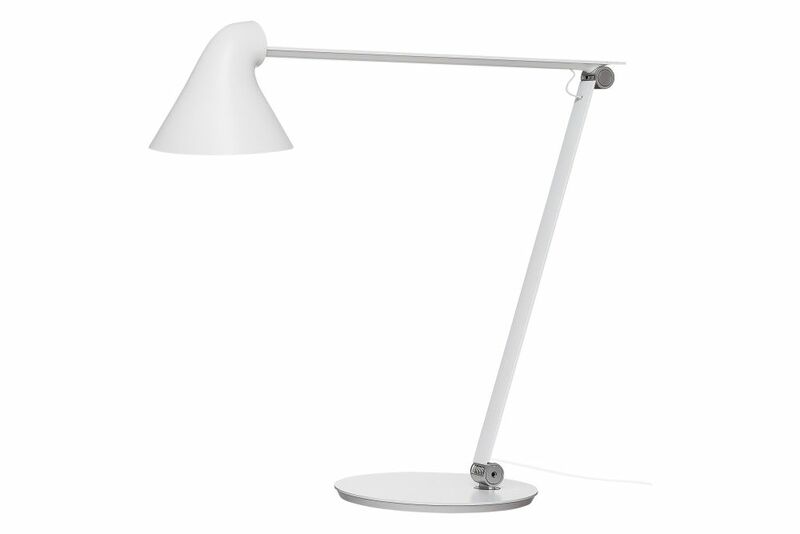 The lamp's simple functionalist design includes a groove in the arms in which the cord is visibly recessed. The arms' design makes them appear light, as the eye is drawn to the flat top section, while the structure is reinforced using a triangular profile. The lamp has several options for installation. It can be mounted in a traditional base with a bevelled edge, making the lamp appear to hover above the table. It is also available with a pin fitting, in two diameters, for direct attachment to the table top, and finally, with the classic table clamp. With its ultra-minimalist design, the NJP Table work light is ideal for either solo or repetitive installations. Even in an open office environment the lamp has a discreet presence, and it interplays harmonically with the computer in a personal office.